ExpressVPN is my personal favorite. I travel a lot, which is why 97+ VPN locations under one account is very useful. Also I do a lot of downloading, and I can always get the best speeds in any country without transfer limits. I’m privileged to offer 30 days free and up to 35% Off. The discount coupon code is automatically activated only by using the link below. Note! Don’t open link with ctrl/command or it will not work. Or try another web browser. Make sure, that you can see the above message after clicking on the link! The other thing I love about ExpressVPN is the good level of privacy. Most importantly, they don’t keep any traffic logs. Also the IP addresses are shared, so it’s really hard to trace back to you. And the IPs change frequently to prevent over use, and blacklisting. The host names vary as well, so that no one could even begin to guess you are behind a virtual machine. You can save an additional discount of 35% off if you subscribe to the twelve month plan. On your checkout look for the text: “BONUS: We’ll add 30 free days because you used a referral link.” and you are good to go..! Please, check back later for updates! All and any comments on ExpressVPN and it’s discounts below. You may also share your codes, coupons offers, etc. with us, thanks! По ссылке выше, вы можете получить 30 дней бесплатно по любой подписке на услуги VPN. Никаких обманных скидочных кодов и других маркетинговых трюков. Это просто лучшее предложение для всех новых пользователей. При регистрации на сервисе убедитесь, что вам начислена скидка при оформлении заказа. Если нет, попробуйте использовать ссылку ещё раз перед регистрацией. Пожалуйста, дайте мне знать, если у вас есть возникли какие-либо проблемы или вопросы. Black Friday/Cyber Monday Deal: 25/11/2016 to 28/11/2016 — ended! Hi David, what is your email? I accidentally already signed up without your link so now I have to put your email in to get the 30 days free. Hi. If you leave a comment with the email field filled in, I can mail it to you. Sure, no problem. Mail sent! Sure thing. I dropped you an email. Can you give me your email? I need it to get the 30 days! This is a popular request.. sent! What is the code man? ExpressVPN doesn’t use any actual coupon codes. The link that’s on top of this page activates the one month free offer. The “Save 35%” offer is activated automatically if you purchase a 12 month subscription. Thanks. Hi there! If the link doesn’t work for you – please try to use a different browser to open it! I can guarantee you that the link is working 100%. If it still doesn’t show up the “30 days free” text on top after clicking on it, please get in touch with me and I will help you out. If you already registered without using the offer, I can send you the email. Awesome! The one month free offer is the best discount I’ve found. And btw. do you know if Express VPN does Black Friday promotions? Many thanks.. The answer to your question is no. As far as I know — ExpressVPN has never had Black Friday/Cyber Monday promos. And you will find the usual lot claiming a 35% OFF which is just the regular 12month plan “promo code”. But of course you can never know if they decide to join in on the shopping madness fun for this year. But it is definitely unlikely and most probably not worth the wait. Thanks for asking Antonio! Can I have your email too? Sure mate. I’ll send it over soon. Cheers. Hello David, Please send me your mail address. Hi Ida. There we go — it is sent. thank you man!! finally a real coupon link. 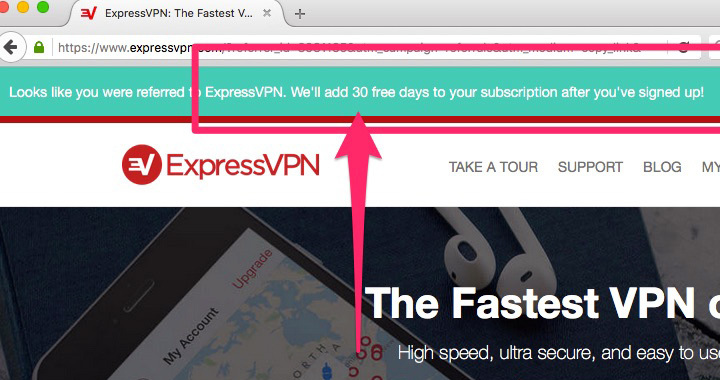 everyone’s saying how fast expressvpn is so looking forward to try it out for the first two months. plus just shared your post on facebook! Great to hear, thanks so much. If you can, please let us know how the two months went afterwards. A lot of people are happy with the speeds and the network is pretty optimum, but it really depends on a multitude of factors like your ISP and where you are physically located. So just have to try it out. Cheers. Hey David, could I get your email address for the 30 day referral? Sure, mail is on it’s way. Cheers! Awesome worked like a charm! Nice…. always good to know & thanks for feedback IQ. Hi Bagus — the offer is not a trial so you will have to purchase at least a 1 month ExpressVPN plan; the 30 days free will be applied to your account if you registered using the link I’ve provided above. 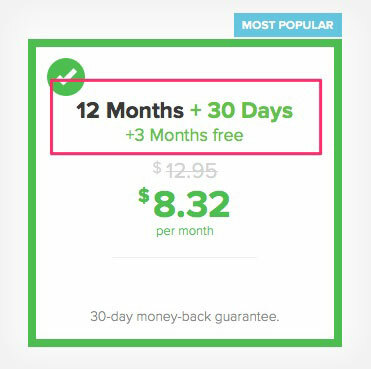 So for example, if you pay for 1month you can use the VPN for 2months. Does that help? Thanks! Sorry mate — this is the best offer there is. Why I pay in accordance with your method to register the account but did not get 30 days free? Loads of thanks for the ExpressVPN referral activation link. It worked well. Yeah no codes needed. Just a 30 days referral from an active account. Hi, I’m not able to get the 30-days offer . Can you please send me thelink. Mind sending an email for me too? I’m happy to assist, Bu. Which web browser are you using? I recommend Firefox. And please, do not press Ctrl, or Command key when you click on it.